There are clear benefits of ice applications to injuries or areas of inflammation. The benefits include limiting onset of inflammation, decreasing pain and improving the chance of tissue recovery. Ice massage is an effective method of cooling a superficial and site specific area of inflammation, such as tendinitis, contusion, or patello-femoral pain syndrome. Effective ice massage can take 5-10 minutes, where as a traditional ice pack requires 15-20 minutes of continuous application. Ice massage is most appropriate for tissue areas that are roughly the size of your hand’s palm and smaller. Pro-Tec Ice Up serves the bicyclist well. It is insulated, portable and easy to use. The insulated carrier allows the product to stay frozen for up to 12 hours. 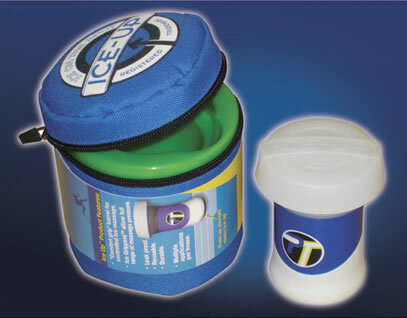 Ice Up is not supposed to leak, and the size easily fits in an athletic bag. This tool is great for remotely and immediately managing chronic injuries as well as addressing injuries as they happen.